From the time they are able to play on their own, small children become engaged in creative play. Whether they prefer caring for a special doll, guiding cars and trucks through imaginary traffic, or whipping up a tasty meal in a pint-sized kitchen, kids of all ages learn and grow through pretend play. Even children who are surrounded by expensive, high-tech video games or have unlimited access to television can be found playing pretend, alone or with their playmates. You can help your child develop his or her creativity with high-quality toys that stimulate the imagination. What are some of the benefits of pretend play? * Empathy - When your child pretends to be a mommy, or a doctor, or a construction worker, she is putting herself in the position of another person and allowing herself to see things through the eyes of another. This can help develop a sense of empathy, or understanding how others feel. * Confidence - By imagining themselves to be the character they are playing, children begin to see that they can be anyone they want to be. This is helpful for developing their confidence and self-esteem. * Problem-solving skills - As your child imagines himself in a made-up situation, he thinks about how to solve problems and make the game work. 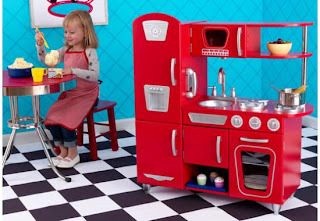 In a pretend play kitchen, for example, your little chef may need to think about how to set a table, what he can use for pretend food to cook, or how to work with other children who are "helping." How can I encourage my child in games of pretend? Because pretend play is part of your child’s development, it is important to encourage him and his creativity. While you will probably not get very far by trying to start games of pretend yourself, you can urge him on when you see him caught up in make-believe. Act out the part of a customer in a restaurant, be the first in line at the cash register, or offer to help with the dishes in the play kitchen. Where can I find the best pretend play kitchens and other realistic toys to help my child grow? Role play does not require hundreds of dollars worth of expensive equipment, electronics, or tiny parts. You can assist with your child’s creativity with well-made, appealing, and realistic toys like pretend play kitchens, complete with appliances, dishes, pots and pans, and more – find everything you need to get her imagination rolling with pretend play toys from A Kid Place.